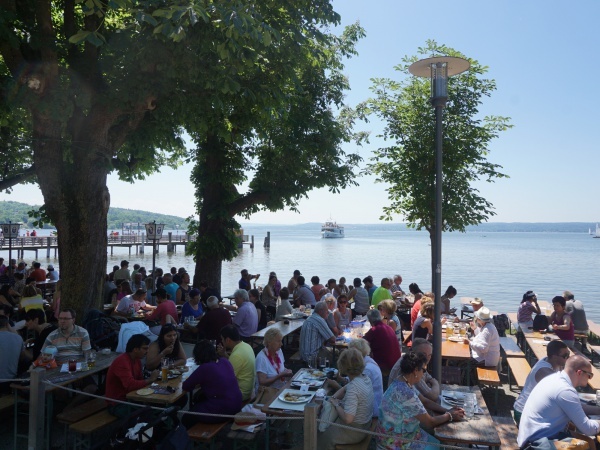 The Seehof Herrsching beer garden is located in Herrsching directly at the lakeside of Ammersee, about 30 kilometres southwest of Munich. 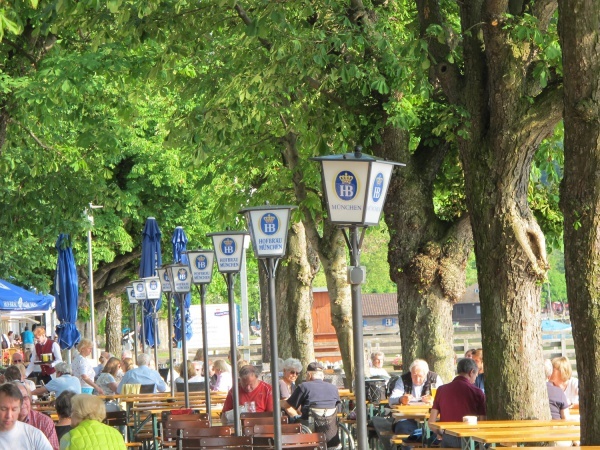 The beer garden lies at the longest lakeside promenade in Germany. Seehof Herrsching is a popular excursion beer garden for bikers, hikers and swimmers. Guests planning a cruise on the lake can step on one of the paddle steamers leaving from the jetty next to the beer garden. Seehof Herrsching has a long history. In the middle of the 18th century the lake, then named Ampersee, belonged to a monastery. The monks from Diesen and Andechs used the nearby castle Mühlefeld as their summer residence. In 1885/1886 a guesthouse, today's Seehof, was built near the jetty. A citation out of a guidebook for the Ammersee region from 1898 reads: Hotel restaurant Seehof steamboat jetty, located directly at the lake, lake resort, recommends its comfortable equipped guest rooms starting at 1 Mark. In 1993 the Hofbräu brewery bought the building. After extensive rebuilding in team with the current leaseholders, Seehof Herrsching reopened in 1996 with six dining rooms, four seminar rooms, a main restaurant, the beer garden and 43 hotel rooms. The beer garden has about 600 seats in the self-serviced area and about 200 seats in a serviced area. The traditional beer garden benches in the self-serviced area are shaded by an alley of large chestnut trees. Regardless of where to sit, each table offers a great view onto the lake with a spectacular mountain panorama on the horizon on clear days. The beer garden is well-visited especially during lunch time. The food stall of the self-serviced area offers typical beer garden meals, such as Obatzda, Wurstsalat (sliced sausage salad), Hendl (roasted chicken) and Spätzle (Bavarian cheese noodles). The main restaurant is well known for its fish specialties. All ingredients used in the kitchen are from the region. The fish comes from the fish farm Wiegel in Landsberg and the fishery Rieger at the Walchensee. Seehof Herrsching has won several awards for regional specialties, including bronze in the Bayerische Küche 2010. The beer served is Hofbräu and a Maß Hell costs €7.10 (May 2018). From May to September various music bands perform on sunny Sundays and public holidays on a small stage in the beer garden and sometimes even on the jetty. Major football tournaments are shown live in the beer garden. Depending on the weather, the beer garden is open daily from 11am to 10.30pm. This page was last modified on 18 May 2018, at 19:31.